This invention may interest only those who fly in the winter. 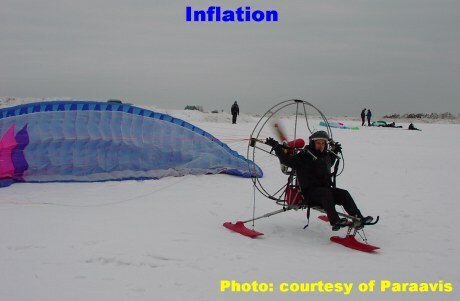 The Moscow based Paraavis company (www.paraavis.com) has been designing parachutes and paragliders for a long time. 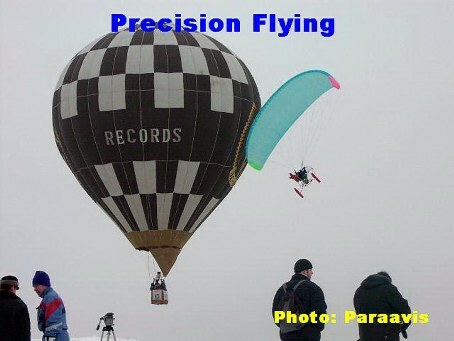 A few years ago, Paraavis began the manufacturing of Paramotors as well. Backed up by an excellent technical team, the company realized how important it was to be competitive and innovative. Taking advantage of the huge potential offered by the Russian military disassembling the life threatening rockets, the team decided to use the Titanium obtained from the military for a better purpose... for safer flying. This is how the team started to build Titanium paramotors. Titanium has a huge advantage in aviation over steel or Aluminum alloys. It is 10-15% stronger than Cr-Mo steel and three times as strong ast 6061-T6 Aluminum. This metal is very much used in Space Technology as well. It is almost inert in normal conditions so it will not corrode or tarnish. It does not need painting and scratches can be easily removed by buffing. 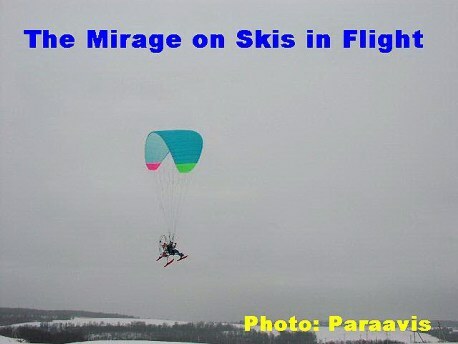 A new generation of paramotors was built: The Mirage. Utilizing the excellent new engine Cors-Air M21Y available from JPX Italia (www.jpxitalia.com) Paraavis began mass producing the Mirage. 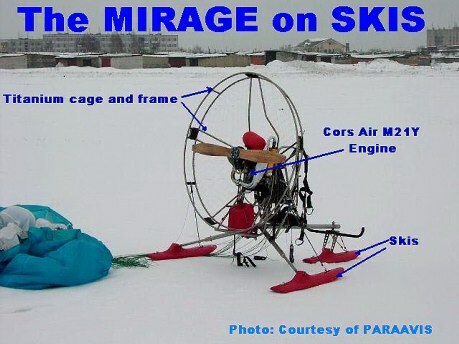 Because of the very long Russian snowy winters, Paraavis took another step: they designed and built their first paramotor on skis. This paramotor uses different wings made at the Paraavis factory. It has three skis for landing gear and I was assured it can handle snow very well. As seen in the picture above, the front wheel (ski I should say) is fully steerable, just like a Powered Parachute or a PPG Trike. Due to the Titanium construction, the whole contraption is very light but strong and elastic enough to absorb even considerable impacts. Titanium will act like a spring and the cage is very unlikely to bend. More and more PPG manufacturers turn to this Space Age material for their machines. As seen in the picture below, this PPG is very maneuverable. However, I would not recommend any pilot to try such turns. Paraavis used their own test pilot for this demonstration for the media.